Six weeks after the bj-league’s final game, it’s now a good time to dust the cobwebs off the memory bank . . . Hoop Scoop chronicled the highlights and lowlights of the final 10 seasons of the bj-league’s wild 11-year run, and it’s time to unveil a list of memories that will endure as great feats (or favorite memories) in the annals of Japan basketball. What follows is an incomplete list of Hoop Scoop’s best-of-the-best highlights. It all starts with legendary big man Jeff Newton’s epic 50-point outburst in the Western Conference final at the Final Four in May 2009. 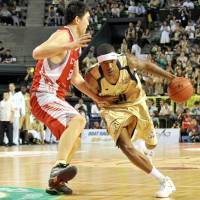 The Indiana University alum’s brilliance carried the Ryukyu Golden Kings past the Osaka Evessa and into the title game for the first time at Ariake Colosseum. The Evessa, three-time defending champions and Newton’s former team, were the league’s first dynasty. But Newton’s dynamic performance that day changed the course of league history, ending the Osaka dynasty and setting the stage for the first of four Ryukyu championships a day later. Fast forward to Newton’s No. 50 jersey retirement in November 2015. The Golden Kings, recognizing Newton’s special place in team (and Japan basketball) history gave him his special day. Newton who had won his sixth overall title, and third with the Kings in May 2014 in his final pro game, quietly retired months later, and then closed this chapter of his life in grand style in Okinawa City. He exited the big stage as the winningest player in league history. More than anyone else, diminutive guard Cohey Aoki was the face of the league while suiting up for the Tokyo Apache, Osaka Evessa, Tokyo Cinq Reves and his hometown Rizing Fukuoka. Aoki’s special relationship with fans, his knack for knocking down free throws and big shots, especially with the shot clock running down or in the closing moments of game, is legendary. Most appropriate, Aoki appeared in nine All-Star Games, more than any player in league history (though it’s inexcusable that the league failed to find a place for him in the final All-Star Game in January). The General. League legend Lynn Washington brought his Indiana mentor Bob Knight’s unquenchable thirst for winning to the Evessa and along with Newton formed the frontcourt backbone of the team’s championship three-peat alongside David Palmer and Matt Lottich, who are now pursuing college coaching opportunities. Washington was a fearless advocate for advancing the game and promoting it here. In addition to the aforementioned championships, Washington’s teams advanced to the Final Four in every one of his six Evessa seasons. ‘Nuff said. Witnessing 236-cm center Sun Ming Ming’s debut with the Hamamatsu Higashimikawa Phoenix in 2008. The Chinese giant’s inside presence and playful humor added intrigue and fun to the league that season. What’s more, he’s among the tallest humans to ever play the game. The presence of a rotating cast of foreign coaches, including Joe Bryant, John Neumann, Bob Hill, Bill Cartwright, Zeljko Pavlicevic, Charlie Parker and Bob Nash, brought NBA and international basketball experience to the table. They gave legitimacy to their teams and an endless supply of stories about their days in the game. The nonstop expansion for more than a decade brought an influx of NCAA Division I and smaller-college talent to Japan. Impact players such as Andy Ellis, Josh Peppers, Bobby St. Preux, Nick Davis, John “Helicopter” Humphrey, Mikey Marshall, Gary Hamilton, Julius Ashby, Lawrence “Trend” Blackledge, Melvin Ely, Michael Parker, Mike Bell, Wendell White, Nile Murry, Reggie Warren, Jeff Parmer, Draelon Burns, Justin Burrell, Verdell Jones III, Richard Roby, Thomas Kennedy, Le’Bryan Nash, among others, gave fans a taste of the big time and provided constant challenges for their Japanese teammates and foes in practices and games. 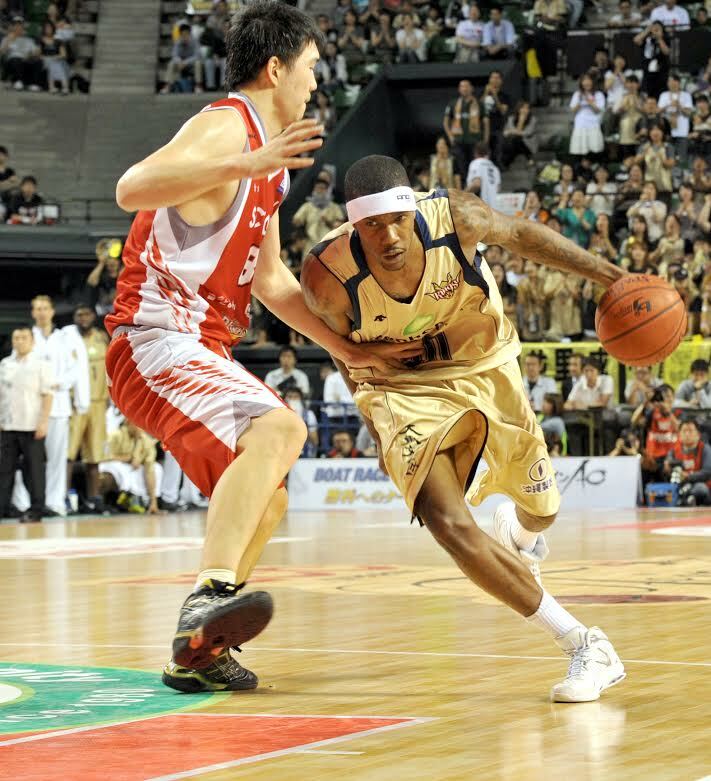 He emerged as a role player for the Evessa’s first two title teams, then high-energy shooting guard Masashi Joho grew in stature and skills with a fierce determination to excel — and win — during the next nine seasons for the Apache, Shiga Lakestars and Toyama. Joho became the only Japanese to win the regular-season MVP honor (2013-14 season) and helped transform the Grouses into a title contender. Joho’s love for the game was infectious and that shined through in every game. From a personal standpoint, it was also special to see the genesis of so many firsts in league history, especially the establishment of so many franchises. Seeing the fans’ excitement along the way was neat, too. Similarly, viewing first-ever regular-season home games for the Akita Northern Happinets, Shiga, Kyoto, Hamamatsu, Yokohama B-Corsairs and Chiba Jets provided colorful drama and a courtside view of history unfolding. That spirited exemplified what many teams exhibited four years later. After the Great East Japan Earthquake ended the Sendai 89ers’ 2010-11 season, it was a touch of class to see players from that team, including fan favorites Takehiko Shimura and Hikaru Kusaka, donning No. 89 jerseys for the remainder of the season with their temporary new clubs. In a related event in my mind that was also special; Seeing the rebuilt train line in Minamisanriku, Miyagi Prefecture, in March 2013, while heading to cover a Sendai-Osaka game there on a Sunday and conversing with a local train station engineer who revealed, while beaming with pride, he was thrilled to get Cartwright’s autograph the night before. Another favorite: Seeing rivalries form, such as the fierce Osaka-Ryukyu rivalry, fans interact, local media take pride in reporting on their hometown teams, this columnist traveled to all corners of this country for a decade seeing teams plant the seeds for the sport. Among the great performances seen in person or written about shortly thereafter, here are a few that must be mentioned: Rizing star Parker’s 53-point, 21-rebound outburst in November 2010 against Takamatsu; Newton’s 40-point, 30-rebound effort Sendai in November 2008; Toyama’s Kirby Lemmons 42-point, 30-board night against the Rizing in October 2009; and Fukushima Firebonds star Le’Bryan Nash’s record 54-point performance on Feb. 28 against the Shinshu Brave Warriors. Final Four exploits also remain etched in the mind’s eye. Those include Yokohama sharpshooter and captain Masayuki Kabaya’s 35-point championship game masterpiece in May 2013 against the vanquished Rizing; Ryukyu perimeter marksman Ryuichi Kishimoto’s 34-point output, including seven 3s, in the title contest against Akita a year later; and Hamamatsu sparkplug Masahiro Oguchi’s stunning 10-for-14 3-point shooting night in the East final against Niigata in May 2009 a day before the Phoenix’s first of three bj-league titles. It was a public display of humor and also a playful jab at me for not being there to chronicle the Apache. Just as memorable was the across-the-ocean attempts to reach Tyler on draft night in June 2011 after he was selected No. 39 overall by the Charlotte Bobcats and sent to the Golden State Warriors in a cash trade. This reporter, using the sports desk fax machine phone repeatedly called the San Diego night club, where Tyler held a party that night. It was a failed attempt to reach him for comment, but it was exhilarating on deadline in an effort to enrich a story about the lone player in league history to make the jump via the draft from the bj-league to the NBA.